In a year in which tech companies have struggled to stay alive, Apple’s stock has more than doubled. 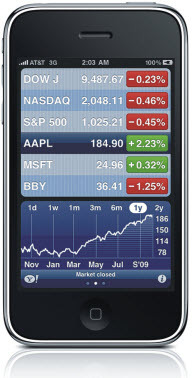 In January of 2009, Apple stock was priced at $78. Last week, it closed at $184. Also late last week, three major investment firms elevated their expectations for Apple. On Thursday, Oppenheimer analyst Yair Reiner increased his target price for Apple from $185 to $210, while Bank of America/Merrill Lynch analyst Scott Craig increased his target from $185 to $220. On Friday, UBS analyst Maynard Um jumped on the Apple bandwagon, and raised the bet, escalating Apple’s target price from $170 to $265. A 236% jump in stock price from January to October would be remarkable for any company. But in the case of Apple, it happened under the most bizarre of circumstances. The economy is in the midst of a global recession. Apple’s CEO, Steve Jobs, took a 6 month medical leave, starting in January. Although Jobs is rumored to have returned on time in June, his return wasn’t publicly confirmed until 3 months later, when Jobs hosted a September 9th Apple media event in San Francisco. Job’s had surgery for pancreatic cancer in 2004. The disease is particularly vicious, with less than 5% of victims surviving for 5 years. With 2009 being the fifth year since Job’s diagnosis, speculation was widespread among Apple watchers that Jobs’ medical condition was terminal. That speculation may well have been true, since Jobs was rumored, and later confirmed, to have undergone a liver transplant in April of 2009. Could any other company not only have survived, but flourished under these circumstances? Could Microsoft’s stock have doubled during a period in which Bill Gates was suspected to be terminally ill and confirmed to have undergone a liver transplant? I doubt it, I think Microsoft would have been lucky to break even. It’s even harder to explain Apple’s momentum under such conditions when you consider how closely Jobs’ presence has been linked to Apple’s success (and how closely Job’s absence was linked to Apple’s failure, in the early 1990s). Apple’s momentum makes me curious about one question in particular: what is it that has investors so fascinated with Apple? Certainly, Mac OS X is a part of the fascination. As Apple’s commercials repeatedly remind us, the operating system is less prone to security risks than Windows. Further, in the opinion of many that use both Mac OS X and Windows (myself included), Mac OS X is less crash prone than Windows. Perhaps equally important, Mac OS X has an aesthetic quality to it which Microsoft has never been able to duplicate in Windows (despite apparently trying). It’s easy for me to believe that Microsoft’s “Start Button” was inspired by Apple’s “Apple Menu”, and that bundling photo editing support into Vista was an effort by Microsoft to make Windows have value added features similar to those found in Mac OS X. Of course, it’s not just the operating system. Apple’s iMac product line has succeeded in creating a series off all-in-one computers with a level of popularity that has never been equaled by a PC manufacturer. And there’s no denying the power of Apple’s Mac Pro desktop towers, which have thrived in the photo-editing, video-editing, and music-editing world, despite a $2500 price tag (for a comparatively low end model). Regardless, Apple computers and operating systems have been around for a very long time. I believe that Apple’s momentum comes not from its computer business, but from its innovative thinking as it entered into other businesses, such as selling music, iPods, and iPhones. Take a moment and consider what was happening in the music business when the Apple iTunes store opened in 2003: the industry was in upheaval because of the Internet. Instead of fighting the unstoppable trend of music downloading, Apple seized upon it as a business opportunity. Six years later, according to Apple Senior Vice President of Worldwide Product Marketing, Phil Schiller, the iTunes store has sold over 6 billion songs. In the end, this is Apple’s strength, and the reason for Apple’s momentum: its insatiable appetite for innovation. Whether its cheap downloadable music, multi-colored iPods with video capture, or iPhones with over 75,000 third-party apps, Apple has stayed many steps ahead of its competition in the business of innovation, and Apple’s momentum will continue for as long as Apple continues to innovate. Anthony Celeste is a technical writer, multimedia developer, and Windows programmer. Anthony wrote about color theory and Web design in “Corel DRAW 10: The Official Guide”, and covered animation and special effects in “Ulead PhotoImpact 7: The Official Guide”. Investors are liking Apple because Apple has world class products.